New from 2019: air conditioning installed throughout, providing either warm or cool air. The whole villa has 2 apartments, which are completely independent, or will sleep 8 when rented as a whole. EACH apartment has: 1 twin and 1 double bedroom, bathroom, modern fully-fitted kitchen with cutlery and crockery, dining area, living room with Cable TV, DVD/CD, free Wifi; bed linen and towels provided and changed weekly. There are electric radiators for the winter for those who prefer not to use the aircon. Both apartments have their own patio; there is a small garden to the lower apartment, and an additional roof terrace to the upper. San Juan de Capistrano has beautiful established gardens and walkways, large supervised communal and children's pools (Easter to end-October), a small shop and many bar/restaurants (not all are open during the winter). New from 2019: air conditioning throughout, providing either warm or cool air. Sleeping between 4 and 8 people, this pretty white painted villa has its own terraces and enclosed private lawn garden with shrubs and fruit trees. The garden is ideal for babies and small kids who need some area shaded by the olive tree to play in, or for adults who merely want to read and snooze in the quiet. With the mountains behind and views to the sea at nearby Nerja, this is an idyllic spot. The villa is ideal for larger groups, or for 2 families, who want to be together. The 2 apartments allow you to be together when you want to be, or separate when you need to be. Or each apartment can be rented by couples or families for an intimate, relaxing holiday. NB: if you want to rent BOTH apartments for the same dates, you must make the booking via the WHOLE VILLA selection: the website cannot make 2 separate bookings for the apartments for the same dates. The villa is set in the small multi-national community of San Juan de Capistrano. This is a perfect location - 2 mins walk from the superb pool complex which is surrounded by lawns and cafes, bars and a shop - near enough to get to easily but far enough away to be quiet and peaceful. How can I choose between the 2 Apartments? Both have similar accommodation: one twin and one double bedroom, a living/dining area and a fully fitted kitchen with fridge/freezer, microwave, etc. Both apartments have free Wifi, and air conditioning. The upper apartment has a large patio with a spiral staircase leading to a roof terrace. Inside, it has a fully-fitted kitchen with ceramic hob, electric oven, washing machine, and a bathroom with a shower (but no bath). The lower has a smaller terrace, and it leads to a little private garden with grass and shady-trees. In the garden annex there is a washing machine. The kitchen has a ceramic hob and electric oven, plus it has a combination microwave. The bathroom has a bath and an overhead shower. For those who prefer not to use the installed air conditioning, the apartments also have floor-standing fans for the summer, and oil-filled electric heaters for the winter. The villa is ideal for large families or groups of friends, or for 2 families who want to holiday together! Beach and Pool Complex. : Nerja has about 16km of beaches, all of which are easily accessible. The nearest beach, and in our opinion the best, is Burriana, about 2 kms from the villa. The 800-metre beach is a mixture of fine sand and pebbles and has all the facilities you could wish for. There are numerous beach bars and seafront cafes here. There's a full range of water sports including scuba diving and boat cruises along the coast. There is a bus service from near the villa into town. The timetables are seasonal, and you can use these to get you near to the beaches. There is ample car parking at all the beaches. The beaches, and the communal pool on the site, have umbrellas and sunbeds for hire. Our apartment has sunbeds, and sun umbrellas which you are welcome to use at the pool or beach. The pool complex has lifeguards on duty during open hours. The beaches also are guarded during the height of the season. Local Restaurants and Shopping: There are loads of restaurants in the town, a huge variety of British run and international, and also local Spanish. On the urbanization, there are 6 bar/restaurants, and bars/cafes around the pool that serve food and drinks. The local shopping is easily accessible. Next to the pool complex on site is a 'sells- everything' supermarket. Then at the exit off the main road to the site is a very large supermarket selling a vast range of British produce. Then, of course, Nerja has several comprehensive Spanish supermarkets. Upper apartment: toilet, basin and shower enclosure only. Lower apartment: toilet, basin, bidet and bath with shower. Newly installed throughout from 2019, providing either warm or cool air. Oil-filled electric radiators in both apartments, for those who prefer not to use the aircon. All bedding, duvets etc provided. Ample nearby on-street parking in 2 areas. Each apartment has sofa and armchair. TV/DVD/radio. Sofa in lower apartment converts into a double bed, plus it has a pull-out single bed. Ceramic hobs in both apartments. Electric ovens in both apartments. Microwave in each apartment. Lower one includes a grill. Full range of items in both apartments, each suitable for 6 people. Modern, fully-fitted in both apartments. Lounge/diner in each apartment, suitable for 6 diners. Additional large table on upper apartment terrace, takes 8 diners. Child booster chair is available for minimal hire fee. Air conditioned. Cable TV provides full range of British, Spanish, Scandinavian, plus some French and German channels. Lower apartment has garden with olive, orange, peach and nispera trees, plus flower beds and lawn area. Ideal for 2 families holidaying together, but who want to retain a bit of independence. Outside stairway connects upper to lower apartment, protected at both ends by security gates for child safety. 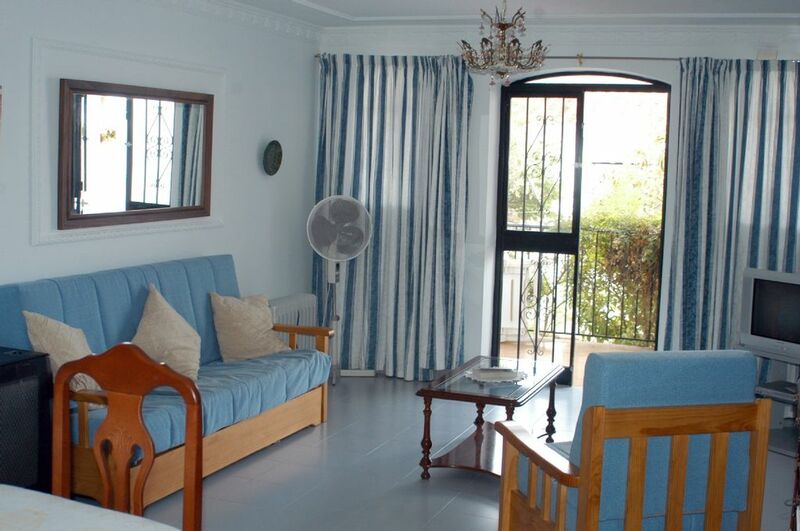 Each apartment is self contained, and can be rented individually or as a whole. Cot and booster chair available for a minimal charge. Swimming pool is communal, large, well maintained and supervised and is a major attraction. The communal grounds are beautifully landscaped and patrolled by security guards. The kitchen and bathroom in both apartments have been recently totally renovated. The lounge furniture in both apartments is new. The lower apartment has a sofa bed which makes into a further double and single bed. The whole area is quiet and peaceful, away from the bustle of the town; yet Nerja and its beaches are within easy reach by foot or a short bus ride. Nice Property,comfortable beds, nice living room and furniture. The accommodation was in a convenient position and was furnished very well, we thought that the kitchen needed more cooking equipment.Overall it suited our needs and would consider booking it again.The owner was very thoughtful and helpfull. Villa with beautiful views of Nerja and the sea. We stayed in the top apartment and enjoyed the upper terrace. Apartment has everything you need inside well equipped. Communal pool is fantastic and has a kids pool too. Surrounding area Unbelievably quiet just perfect for my family. We stayed in the upper apartment, it was great, lovely views from the balcony and sun terrace. The apartment had everything we needed plenty of room for 4 people, the kitchen area was very good nice big fridge. Bedrooms were roomy and comfortable. The pool just 5 mins walk was great, and the garden areas between the villas so beautiful and well kept. We had plenty of hot days and lovely warm evenings in Nerja and it was the 1st week in October. Will certainly be booking again and probably with more members of the family. Thank you. We have just returned from a stay in the lower apartment. As we had two small children we accepted the owner's recommendation of staying in the lower apartment. The apartment was clean and had everything that we needed. The verandah and garden provided areas of both sun and shade at all times of the day. The location of the apartment within the complex was perfect. The complex itself was lovely. We pretty much had the children's pool and adjacent sun deck to ourselves the entire holiday and liked the fact that part of the children's pool was in the shade at most times during the day. You do have to pay to hire loungers and umbrellas by the pool (3 euros and 1 euro respectively) but there is enough grass space to put your towels down if you don't want to pay. The restaurants at the complex were very good and very convenient. We had a car and drove to the beach (ample parking near the town centre and often free parking on the street is available). We would not have fancied the trek up the hill in the heat and with two toddlers. We also drove to The Alhambra which was amazing. The owners were very helpful and prompt in answering all correspondence. We would definitely recommend the apartment to all and would love to return. We have stayed at San Juan de Capistrano many times now in different apartments all with slightly different views of the town and sea but we feel that this apartment was the best we have been to for both location and views. It is very close to the pool area and the shop and restaurants and is yet in a very peaceful location. The apartment had everything you could need for a holiday and roof terrace had the best views we have ever seen. a real home from home. The week that we stayed was Feria week and I would really recommend it as there was lots to see and do. We will be back soon. Nerja nestles in the foothills of the Almijara range (excellent walking). The town is pretty and has avoided the Torremolinos-type tower blocks. It has narrow, winding streets, whitewashed houses with wrought iron terraces. At its heart is the Balcón de Europa, a magnificent promenade along the edge of a towering cliff overlooking some 16 kms of sandy beaches and small secluded coves. There are panoramic views of the Mediterranean against an awesome backdrop of hazy blue mountains. Nerja's most spectacular attraction is its fascinating caves, located just 1 km from our villa. They include archaeological treasures such as paintings over 20,000 yrs old and other pre-historic remains. One of the enormous natural caverns has been transformed into a concert hall, where many performances are staged during the summer. Finally, for those who want to enjoy Nerja's many nightclubs and bars into the early hours, then the Tutti Frutti area in the centre of town is perfect for you. Other Activities: World famous caves, go-karting, scuba courses. 90minutes Granada, Alhambra, skiing,etc. Rentals apply per apartment; remember there are 2 apartments in the villa, each can be rented alone. If BOTH apartments are required for the same booking, this can only be achieved by booking the villa through the WHOLE VILLA selection. Late bookings and repeat bookings attract a discount. Please ask.